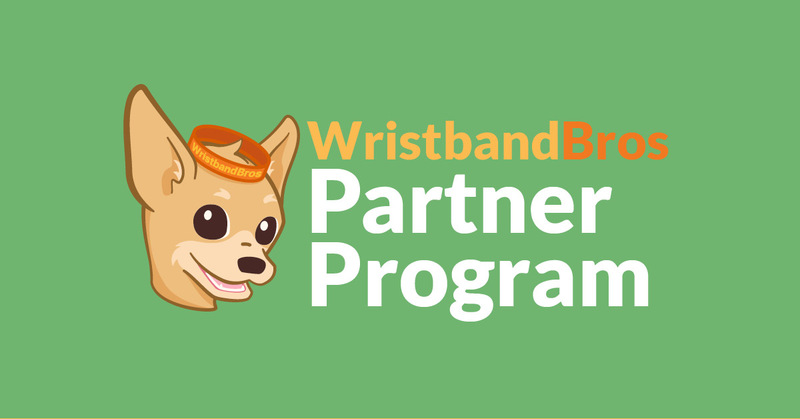 We’re excited to announce the Wristband Bros Partner Program! This is a rewards program that helps us generate awareness of our product, and rewards you with pricing discounts and free wristbands. Classic win-win! After enrolling via the form below, we’ll provide a referral link to share on your website and/or social media. Once the link is posted online, email us proof and we’ll send a 25% off promo code. This code will not expire and can be used on your next order. Behind the scenes, Wristband Bros will track any orders placed by customers who followed your referral link. You’ll earn free wristbands for every referred purchase. When you’re ready to redeem your free wristbands, reach out to us and we’ll work with you to design some impressive (and free) wristbands! As a Partner Program member, you’ll accrue free wristbands for orders placed through a referral link we provide you, and also receive an exclusive partner discount code to use on your next order. As for us? We get a little help spreading awareness about Wristband Bros from good people like you. What the heck is a referral link, you ask? Good question! We’ll provide a unique web address link and you can post this link on your website, blog, social media or anywhere else you have an online presence. The link we provide will be tagged with unique characters that let us know any traffic that comes to our website through that link came from you! So what do we do once we realize someone has come to our website through your referral link and made a purchase? We catalog the sale and you start to accrue rewards! 25% off your next order (max of $500 off). You qualify for this reward by posting our referral link online. Once you’ve posted the link, email ryan@merchbro.com a link back to the page you posted it on, or a screenshot showing the active link. Please use the Subject Line: I’ve Posted My Link! In your email so we don’t miss it! Free wristbands every time you refer a purchaser. * Any time someone comes through your unique link, we track that visitor. If they make a purchase, you’ll be rewarded with free wristbands to the tune of 10% of the customer’s purchase. If a customer purchases 250 bands, you will accrue 25 wristband credits. If they buy 500, you’ll accrue 50 free wristbands. *The max amount of free wristbands that can be earned on any one referral purchase is set at 500 wristbands. There is no maximum set on the number of total free wristbands that can be accrued through multiple referral sales. We redeem the right to revoke any Partner Program membership that is deemed by us to have negative effects on the Wristband Bros reputation and/or does not comply with our Terms & Conditions. There’s a designer in all of us!